ViewFence simplifies home search for buyers by letting them store, score, and rank homes on the cloud. For Realtors®, it is a handy tool to demonstrate their skills and honesty to build larger client base. 1. 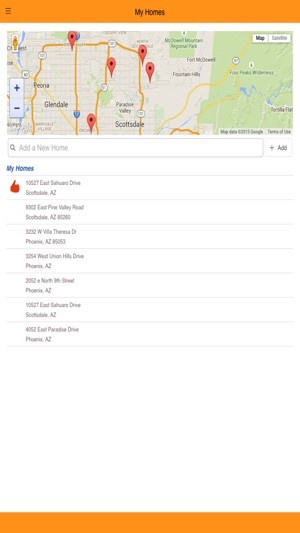 ViewFence is a tool to make your home search more effective by keeping an electronic record, of the homes you visit. 2. With ViewFence, home buyers can save notes and pictures of the home as they are walking through the home, score and rank the home, and share it online with their friends and family. 3. Home buyers can also ANONYMOUSLY ask a Realtor for 2nd opinion of the home they have liked. 4. In addition, home buyers can view online other public opinions and ranking for the home to make an informed decision. 1. ViewFence reviews give the seller and listing agent an insight into subtle aspects of the property, noticed by buyers' agents. 2. Listing agents and sellers can then direct their marketing efforts to alleviate/mitigate any factors that may be limiting true selling potential of the property. 3. Sellers and Listing agents may also notice aspects of the property that are admired by the buyers' agent, and center their marketing around the same. 4. Listing agents can log into ViewFence to answer any concerns the buyer's agent may have. That way, prospective buyers who read the review also have their concerns addressed. 5. For a listing agent ViewFence reviews are a handy tool, when it comes to discussing property feedback with the sellers. 1. GET MORE QUALITY LEADS. ViewFence is your opportunity to demonstrate to prospective clients, how honest and detail oriented you are. 2. Write reviews and know how many times your reviews are read. That is instant marketing for you. 3. Share your reviews with your client base and acquaintances. Keep exhibiting your thoroughness and integrity to your sphere of influence. 4. Last but not the least, build a following for your ViewFence reviews through drip marketing. Keep reaping rewards of your skills and sincerity displayed in the reviews.